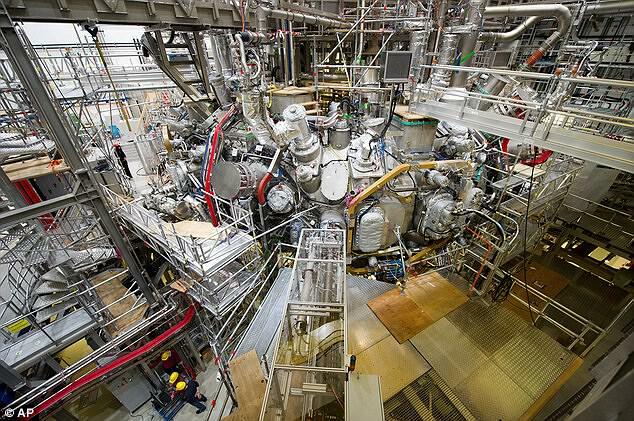 A nuclear fusion experiment in Germany, dubbed the 'star in a jar', has achieved a world record for plasma production, according to its creators. 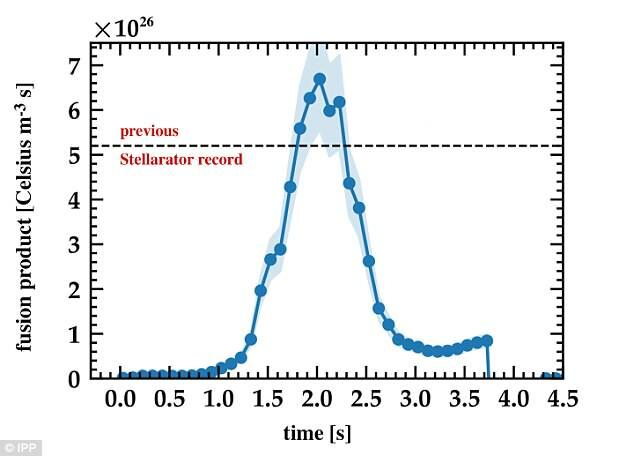 Researchers were able to keep the device, technically known as Wendelstein 7-X, running for longer and at higher energy, than ever before. 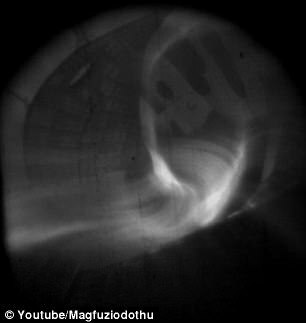 Its performance is the best recorded for a stellarator type reactor and brings the goal of producing limitless energy a step closer to reality, researchers say. The new success was thanks to modifications made to the walls of the reactor, which increase the temperature and efficiency of the reaction. The device, which uses the same processes that fuel the sun, is one of a number around the world attempting to unlock the 'Holy Grail' of energy production. Wendelstein 7-X is located in Greifswald, Germany and operated by researchers at the Max-Planck Institute for Plasma Physics (IPP) and the Wigner Research Centre for Physics. Experts were able to sustain a plasma burst for up to 26 seconds, feeding energy of up to 75 megajoules into it and increasing its heating power. This represents 20 seconds longer and 18 times as much energy as initial attempts. Their eventual aim it to create a high plasma density, a gaseous soup of subatomic particles, that will lead to a self-sustaining fusion reaction. 'First experience with the new wall elements are highly positive', said Professor Thomas Sunn Pedersen, in a written statement. 'This is an excellent value for a device of this size, achieved, moreover, under realistic conditions, i.e. at a high temperature of the plasma ions. WHAT IS A STELLARATOR REACTOR AND HOW DOES IT DIFFER FROM A TOKAMAK? Stellarators are a type of nuclear fusion reactor and are less widely used than tokamak reactors. 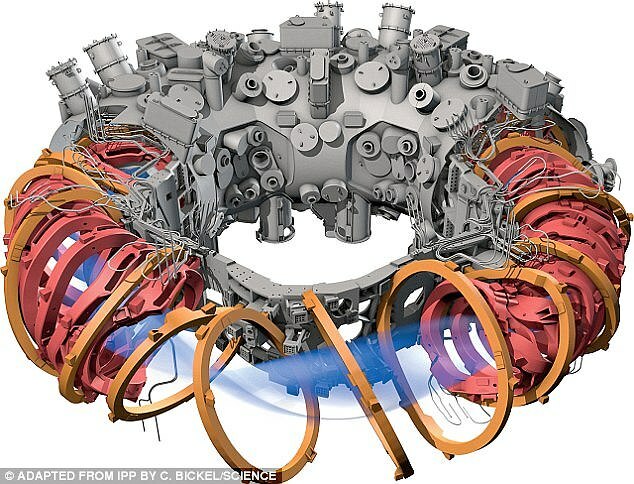 Instead of trying to control plasma with just a 2D magnetic field, which is the approach used by the more common tokamak reactors, the stellerator works by generating twisted, 3D magnetic fields. Stellarators confine the hot, charged gas, otherwise known as plasma, that fuels fusion reactions in these twisty magnetic fields. In contrast, tokamaks use a strong electric current to trap plasma inside a doughnut-shaped device long enough for fusion to take place. The tokamak was conceived by Soviet physicists in the 1950s and is considered fairly easy to build, but extremely difficult to operate. The twisty configuration of stellarators enables them to control the plasma with no need for the current that tokamaks must induce in the gas. 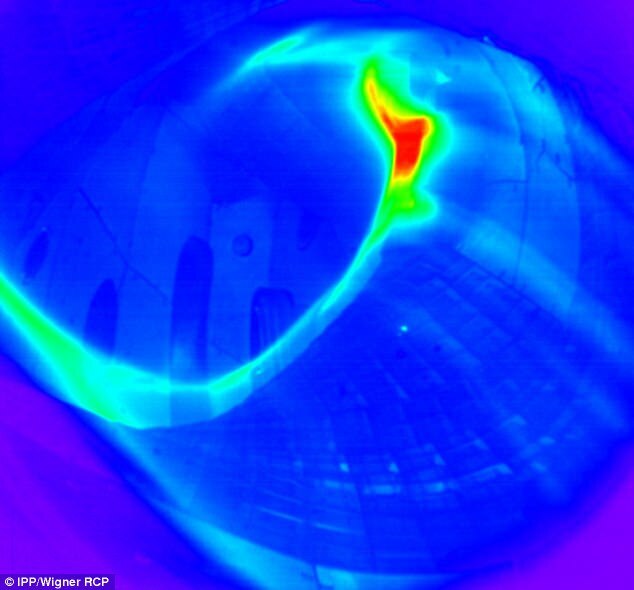 Stellarator plasmas run little risk of disrupting, as can happen in tokamaks, causing the internal current to abruptly halt and fusion reactions to shut down. Stellarators are a type of nuclear fusion reactor less widely used than the more common tokamak reactors. 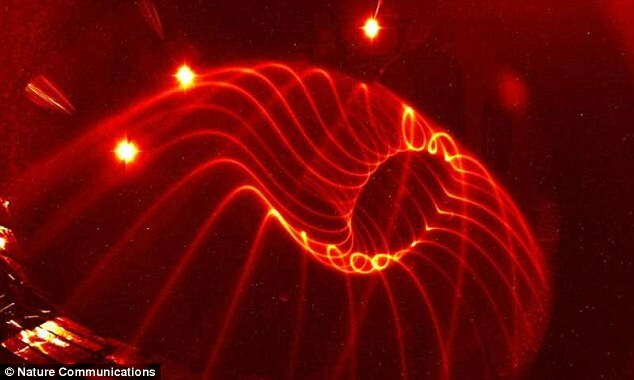 Instead of trying to control plasma with just a 2D magnetic field, achieved via a doughnut shaped configuration in tokameks, the stellerator works by generating twisted, 3D magnetic fields. The vessel walls are now covered with graphite tiles, allowing higher temperatures and longer plasma discharges. A device called a divertor has also been added, which makes it possible to control the purity and density of the plasma. The divertor tiles follow the twisted contour of the plasma edge in the form of ten broad strips along the wall of the plasma vessel. They are designed to particularly protect wall areas that are hit by particles escaping from the edge of the plasma ring. These escaping particles are neutralised and pumped off here, along with any impurities. Experts say that the latest results suggest that their device's unique design may hold promise for being the first to achieve usable power generation by nuclear fusion. In December 2017, a stunning video revealed a look inside Wendelstein 7-X that includes a compilation of footage from tests at the massive device. 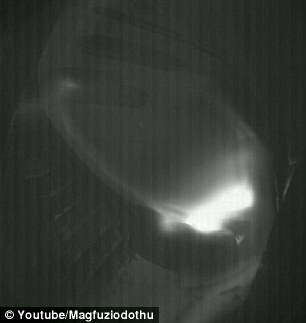 Bright flashes can be seen erupting inside the reactor, showing the path of super-heated-plasma. 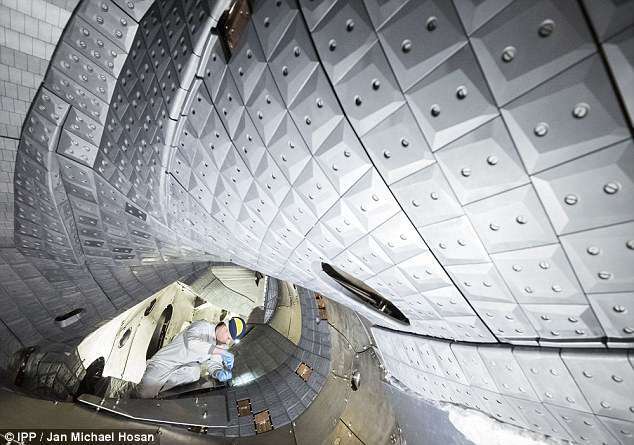 Researchers involved in the project say it’s the largest stellarator fusion device on Earth. The video reveals a jaw-dropping look at the processes that take place on the inside. The reactor was switched on for the first time more than two years ago – and, in December 2016, a research paper on the initial tests revealed everything was working as expected. After a 15-month conversion break, experiments resumed at the fusion device in September 2017. Upgrades means it is now capable of higher heat and longer pulses. The device was also fitted with measuring instruments that allowed scientists to track the turbulence in the plasma. ‘We shall be able for the first time to check whether the promising predictions of theory for a completely optimized stellarator are correct,’ said project head Thomas Klinger in September 2017. The experiment is part of a worldwide effort to harness nuclear fusion, a process in which atoms join at extremely high temperatures and release large amounts of energy. Advocates acknowledge the technology is likely many decades away, but argue that, once achieved, it could replace fossil fuels and conventional nuclear fission reactors. Since the machine has been switched on, researchers have been trying to answer the important question of whether or not it is producing the right magnetic fields. This is crucial because the magnetic field in the machine is the only thing that will trap hot balls of plasma long enough for nuclear fusion to occur. 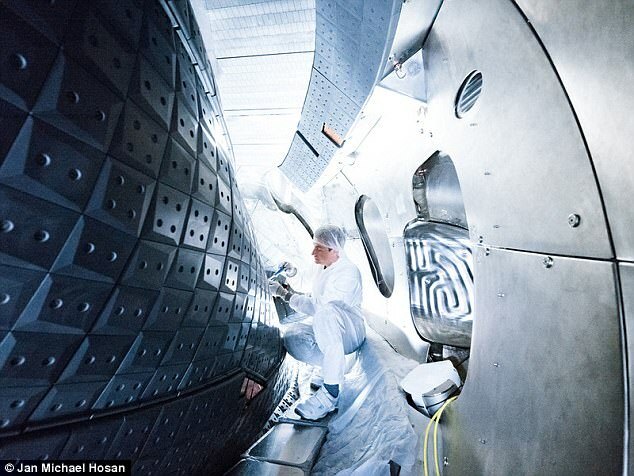 Over the coming years W7-X, which is not designed to produce any energy itself, will continue to test the extreme conditions nuclear fusion devices will be subjected to. The device was first fired up in December 2015 using helium, which is easier to heat than hydrogen.